A piping plover watched over its days-old offspring Thursday on Plymouth Beach. The sand-colored shorebird had all but disappeared by the 1980s along the East Coast, as the beaches it nests on were developed and visited more often by people. Now, the oil spill in the Gulf of Mexico appears to be the tiny white bird’s latest nemesis. Plovers are beginning to fly south as part of an annual migration to gulf shores now fouled with oil. Two weeks ago, bird specialists found the season’s first two piping plovers on the remote Chandeleur Islands off Louisiana, where oil has already washed up. More birds will arrive in the next month and stay on gulf beaches through the winter. The bird is the latest in a series of New England species — bluefin tuna and sea turtles are others — whose populations may suffer because they spend part of their life in the gulf. Unlike seabirds that spend most of their time in the water, piping plovers prefer the shore and are best known for their short bursts of running in the flat, muddy area between the high tide mark and the water line. Specialists fear some may become coated in oil that washes ashore, but they are also concerned the birds’ food source — tiny worms and other marine life — may become polluted and, in turn, poison the birds. Once, piping plovers were common along the Atlantic Coast, but they were heavily hunted — along with other shorebirds — for their feathers, used in hats. Protected in 1918 by the Migratory Bird Treaty Act, the birds’ populations rose through the 1940s, but after World War II began declining again, in part because development ate up areas where they nested. Increased use of beaches is also blamed: The birds can be almost impossible to spot against the backdrop of sand and pebbles, and their habit of nesting in the open on beaches placed them in harm’s way. If they were not inadvertently killed, they often were disrupted enough to abandon nesting areas. In 1986, the Atlantic population of the tiny shorebird — with only 790 breeding pairs identified along the East Coast — was listed as threatened under the Federal Endangered Species Act, and soon, some beaches were closed to vehicles, and in some rare cases, people, to protect the nests. Massachusetts became the focal point in many ways for the fight between public vehicle access and shorebird protection, as some beach users protested off-limits areas. But aggressive recovery efforts for the birds — an army of volunteers fences off nests and even patrols them to keep people and predators away — have paid off. 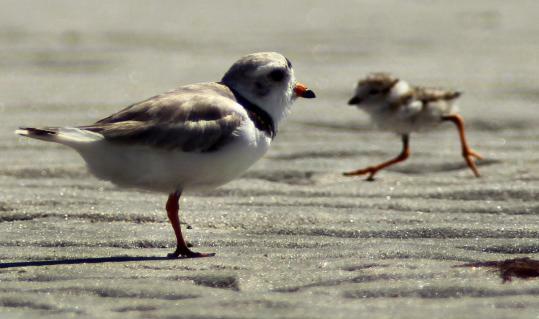 In 1986, there were just 137 pairs of piping plovers, or pips, in the state. In 2009, there were 575 pairs. That represents one-third of the entire Atlantic population, Hecker said. And public sentiment appears to be changing; when piping plovers began nesting on rollicking and busy Revere Beach in recent years, beachgoers took it upon themselves to steer clear of the birds. Now, some worry that painstaking effort may be undercut by the gulf leak. And it is not just piping plovers. Oystercatchers — those comical-looking black and white birds with the large orange beak — also winter in the gulf, as do other plover species. Scientists are also worried about a slew of other birds that make a stopover in the gulf before heading farther south. Scientists don’t know for sure how many Massachusetts piping plovers winter in the gulf, but surveys along 2,835 miles of shoreline there show that roughly 70 percent of all the world’s piping plovers, which include the East Coast population and two other populations in the United States and Canada, winter there. The two piping plovers off Louisiana were located June 20 by a team led by Margo Zdravkovic, director of Coastal Bird Conservation/Conservian, who was conducting a statewide survey of beach-nesting birds and looking for oiled birds. She is worried many of the birds are in such remote places that it will be impossible to assess the full damage of the oil spill. Tom French, assistant director of MassWildlife, said oil was observed on at least two piping plovers after the 2003 Bouchard oil spill in Buzzards Bay, but they survived without being cleaned. The gulf spill is different, he said. The amount of oil is enormous and may still be gushing when the majority of the birds arrive.